Design Driven NYC at WeWork, SoHo. Thanks to FirstMark for the video footage. Design Driven NYC, a series of monthly design / tech talks hosted by FirstMark, brings together a community that lives at the intersection of design, user experience, and technology. My talk centers around “the basics” — from feature level decision-making to core product goals. I discussed Paperless Posts’ photo product as a case study and how we transitioned from a focus on engagement to a focus on experience. I was honored to represent Paperless alongside Alex Blumberg, Co-Founder of Gimlet (previously producer of This American Life, and Co-Founder of Planet Money), David Lee, Chief Creative Officer of Squarespace, and Kelly Sutton, Founder of LayerVault. Design driven companies are the new standard for success and their product designers are changing the way we experience the digital world—both on the screen and in the objects we use every day. During this panel we talked with product designers from a range of technology companies: Katarina Batina, Artsy, Tim Hoover, Canary, and Wynne Chan, Paperless Post. These designers are making the world’s art accessible, venturing into the unknown territory of the Internet of Things with smart home security, and elevating the art of communication. We discussed their paths to product design, the challenges and rewards of being a designer in tech, and design as a vehicle for building beautiful and meaningful products. Today’s designers realize that they have all of the skills necessary to create successful businesses and build careers without clients. This panel featured candid conversations with Peter Buchanan Smith, Kate Bingaman-Burt, Dan Provost and Keenan Cummings — who have founded startups, channeled personal passions into self-made careers, and taken risks to do what they love. We discussed whether the client-service model is a thing of the past and discovered how these pioneers push the definition of design. Watch the full video below. Many thanks to AIGA/NY and Hello World Communications for the video footage. WMCFest 4 — Quit Jobs. Start Projects. There’s a lot of talk about pursuing your passion and not a lot of talk about how to do it. Tim and I haven’t perfected all of the steps toward “doing what you love,” but we’ve found a path—one that starts with side projects. We discovered that a subtle shift in our framework (and mindset) effects the way we make decisions and surprises us with opportunities we wouldn’t expect. In our talk for the Weapons of Mass Creation Fest we talked about the ripple effect of Kern and Burn—our thesis project turned “full-time side-project”—and how it changed our lives, our outlook, and our opportunities. Thanks to Weapons of Mass Creation Fest for the video footage, check out the rest of the amazing speakers here. Pre-recorded interview for an interactive gallery piece featuring women in tech. “Our Time” provides an opportunity for attendees to envision their place among those spotlighted and a space to interact with the community of women who make up and attend GHC. A talk about the journey to discovering your content, refining your craft, and building your community. 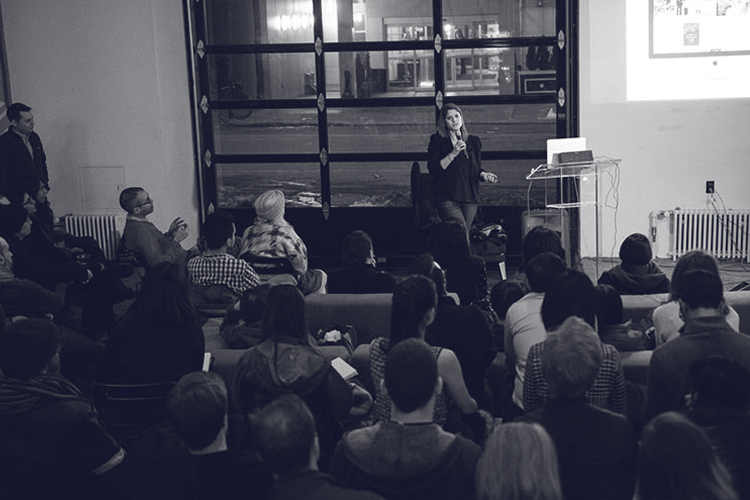 AIGA/NY — The Business of Design: The good, the bad, and the bottom-line. Presented by the Museum of Art and Design (MAD) and sponsored by Google. Panelists: Brandon Velestuk, Creative Director of Product at Slack, Nick Hasty, Director of Engineering at Giphy, and Mark Silver, Executive Director of Design, Customer Experience at The New York Times. I led a workshop on how to present and communicate new ideas with a focus on delivery and clarity of concept. What is design at Paperless Post? I shared our collaborative team structure, current challenges and what we’re most excited about. Presentation here. Hosted by Brooklyn Bridge Ventures and Spotify. Two-part workshop with MICA undergrad design students. I advised students on their initial ideas to launch a project that helps them foster a network for themselves. I represented Paperless Post at Design Driven NYC, a community that lives at the intersection of design, user experience, and technology. Eileen Fisher hosted an internal panel to explore the idea of reimagining the role of technology from an organizational standpoint. I was a panelist along with Alexandra Wilkis Wilson, Chau Banks, Shawna Hausman, and Veronika Sonsev. Two-part weekend workshop with MICA GD MFA thesis candidates.